Head-Smashed-In Buffalo Jump was created in two stages. The first incarnation was performed as a part of the Toronto Fringe Festival in 2005 and the second was performed at the Tank House Theatre in 2007. "When we are wrapped in fear and darkness, we sometimes ask the monster into our bed..."
For reasons beyond her control, Thea has been exiled from the world outside her Parkdale apartment. She's got a bed. She's got a window. And she's got a plan. Using the unique talents of her unlikely cohorts, Bear and Andrea, Thea endeavours to create "a world worth living in." Meanwhile, in the neighbourhood pawnshop, Dusan is archiving memories as quickly as he can appropriate them - using every spare moment to spin bizarre, darkly funny tales into his faithful security camera. UnSpun Theatre invites you to join these four near-broken creatures as they are hurtled toward a fate that is compelling, strange, and endlessly entangled. 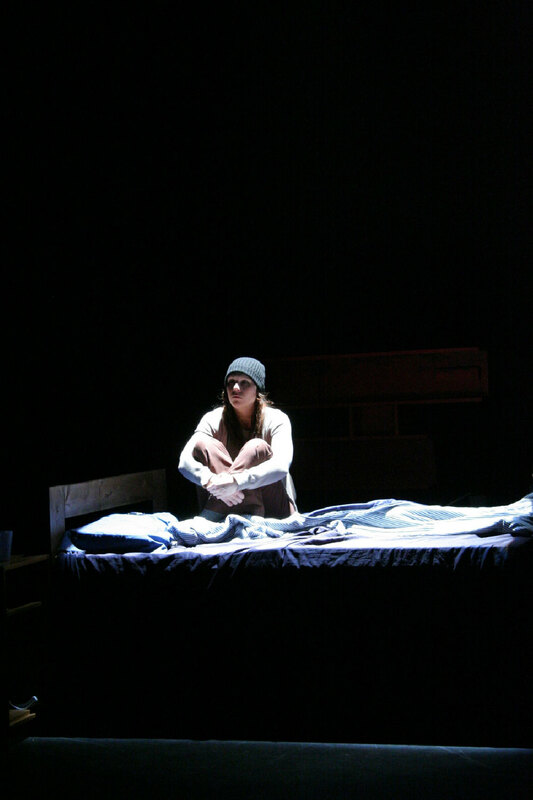 Head-Smashed-In Buffalo Jump was performed in the Tank House Theatre at the Young Centre for Performing Arts in Toronto. Tricia Lahde. Photo by Patrick Beagan. "Performed by a quartet as polished and familiar with itself as any cast in town." "There's lots of talent on display, both in the insightful script and in the committed performances."